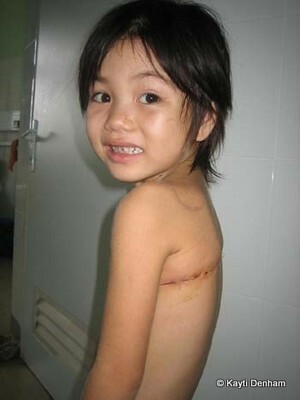 One man has dedicated his life to working with child victims of the US Air Force policy of spraying dioxin-based Agent Orange on large areas of Vietnamese countryside in order to kill vegetation that could hide Viet Cong soldiers. Although the Vietnam war finished decades ago, Kayti Denham explains how Professor Nguyen Viet Nhan's work at Hue College of Medicine continues. Bali, 15 November 2010. Professor Nguyen Viet Nhan has worked out of his office at the Hue College of Medicine and Pharmacy for over 10 years. Before that he graduated from the college way back in 1982, so you could say it has been his constant companion - and the Office of Genetic Counseling and Disabled Children (OGCDC) that he set up at the college is his life's work. Originally Professor Nahn worked in research, looking at the links between the use of aerial defoliants in the Vietnam War and the presentation of birth defects in children in the areas most heavily sprayed. The defoliant used was known as Agent Orange; a poisonous chemical concoction that included the highly toxic compound dioxin. More than thirty years after the end of the conflict dioxins were found to be present in the soil and children were still being born with congenital disabilities. As research progressed the Professor realised that no matter what caused the disabilities the children and the families of these children needed immediate help and assistance - as well as sustainable support for their future. With this in mind The Office of Genetic Counseling and Disabled Children was founded. Supported by the Dean of the Hue College of Medicine and Pharmacy it was ambitious in its vision to not only help alleviate the physical suffering but to assist affected families; many in desperate poverty. The Professor’s dream was of a foundation that would allow for future industry, for valuable lives to be lived. That dream began to slowly be realised and to gain the sponsorship and dedication of volunteers to become the thriving organization it is today. Vietnam is an inclusive society, its beliefs are such that discrimination against physical inabilities is fortunately rare. For a country that suffered so much it is remarkable how much care for the less fortunate exists at a community level. 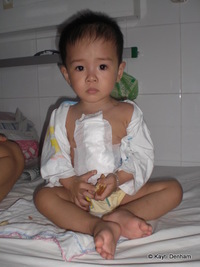 Sadly though when it comes to performing the complicated operations required by some children the costs, even with subsidies, exceed that of most Vietnamese. Also, many of the victims of the chemical spraying were farming people, subsisting on their crops and the bartering of produce, people without recourse to loans or grants to even feed their families, let alone pay for operations. This still prevents many families from going into the city to seek help, to receive support and assistance. They are often denied the care of the city hospitals through no fault of their own, and having to take care of a sick child makes for a very difficult life. These two problems - inability to afford medical care, and inability to seek medical care - presented a huge challenge for the OGCDC. In order to take help to the children they would have to go to the village, take the children from their families and subject them to serious operations away from their homes. To alleviate these issues OGCDC employs rural nurses and trains them to make assessments so they can prioritise up to 44 new cases every three months. They are trained to assess things like autism, cerebral palsy; Down’s Syndrome, mental disabilities, deafness, muteness and blindness as well as physical defects such as cleft palate and withered limbs. 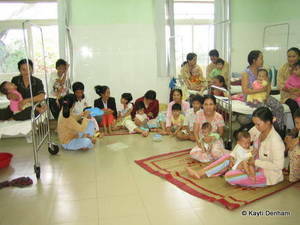 With training the rural nurses can recommend and arrange visits to the center in Hue, and when the money has been raised the doctors can perform operations. After, the rural nurses arrange longer term post operative care to take place in the villages. With this system in place the numbers of cases rose and more people were seeking help for their children. Despite the fact that seven years ago the doctors may have been seeing only one or two cases a month, in the first three months of 2010, 19 heart operations were performed on children. In order to take care of the increasing long term needs of these children, some of whom are now adults, without creating situations of dependency and isolation, the OGCDC is in the process of building and staffing 'houses' where the children can live or visit. These houses are staffed by surrogate mothers thus freeing their parents up to work. At homes like these teaching can also take place for the younger children with the older ones undertaking work on organic farms, craft workshops andsimilar. Visiting health professionals can also go directly to the children and young adults for things like regular dental check ups. As Nahn says, OGCDC never says goodbye, and recognises the commitment to these children is for life. It knows there is no cure for many of the conditions but knows there is the chance for independent lives of great value, for help and for hope. Major surgery is often the only answer when internal organs have been damaged by Agent OrangeThe major obstacle facing OGCDC is funding. Currently dental students are volunteering their time to visit the rural homes, andthe support of overseas visitors like doctors, physical therapists, and speech therapists on vacation enables it to offer services for free to the communities. The organisation has also set up micro credit schemes to create monetary flow but with the down turn in the world's economy sourcing funding is getting harder. With teachers already working on a salary of less than a minimum wage in the city it is hard to get long term commitments from qualified Special Education professionals. In order for the scheme to survive properly it needs thirty teachers, each with a salary of US$100 a month. Although without them the OGCDC can survive, the opportunity lost to the children to be offered education attuned to their specific needs is significant. That would leave them much as they were before, isolated and dependent. Professor Nhan has worked ceaselessly to keep the OGCDC organisation going and through the support of the Spiral Foundation (prominent public figures in Spiral include Will Smith and Angelina Jolie), they have managed to survive. If you intend to, or are inspired to visit Vietnam then a visit to Hue is highly recommended. Located on the Perfume River is it a University town with a rambling old fort and many beautiful tree lined streets, pleasant cafes, and a feeling of elegance and charm. Visiting OGCDC is also possible if you contact them in advance. The Spiral Foundation has a shop in Hue on the corner of Vo Thi Sau and Pham Ngo Lao where you purchase many of the crafts made from recycled materials as well as traditional style clothing and bags. Even if you don’t go there in person, consider supporting the work of OGCDC through the website at www.ogcdc.org or contact us at Gaia and we will put you in touch with Professor Nhan's office.